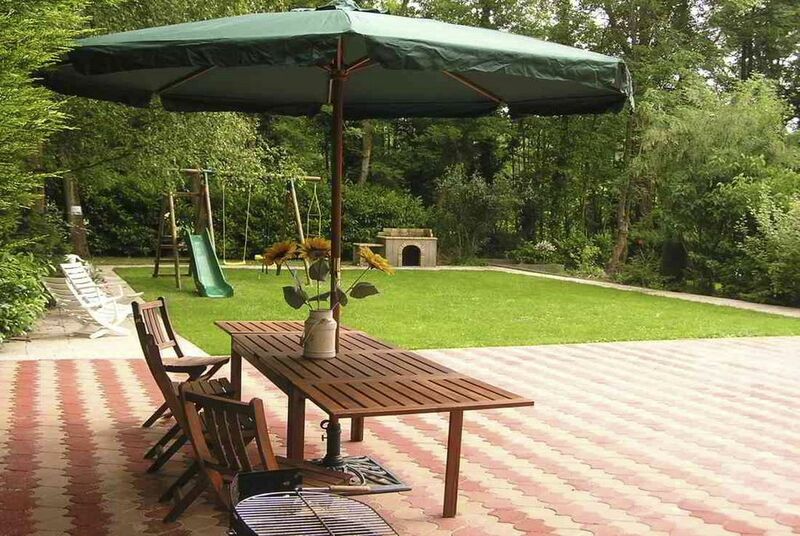 Lopale is a beautiful villa in a sought after road in the forest of Le Touquet. You can relax in this lovely nature spot with easy access to forest walk and the famous dunes. It has 5 bedrooms and sleeps up to 10 people. The kitchen is fully equipped for preparing some of the fantastic produce you may have purchased from the local market. The wood fire will give you all a cosy feeling on colder nights in. In the summer relax on the balcony whilst keeping a discreet eye on the kids in the large back garden. The house will provide you with the perfect base for the beach, golf, shopping or exploring the local gastronomical treasures in nearby towns. Beach: 10 minutes to Le Touquet beach and 5 minutes to Stella Plage beach. Golf: Walking distance to La Mer golf course. 2 mins drive to Le Manoir and Le Foret golf courses. Some of the best golf in Northern France. Supermarkets: 2 mins drive to the Intermarche supermarket and petrol station. Also bike hire and care wash nearby. Fresh daily Bread from Boulongerie Freds, at the end of the supermarket road. Close to beaches. Great for Extended Families, Ideal for Golfers, Large Garden great for children. The property is located about 3.5 miles from the centre of Le Touquet and only really suitable if you come by car. The number of rooms is great for a large group. The garden and BBQ are excellent. We had a few health and safety concerns with the young children in our party, for example there is no balustrade to the staircase from Ground Floor down to the Lower Ground Floor and the garden access door, there are several trip hazards in the garden, and the gap below the metal balustrade to the balcony on the rear elevation was a concern with our grandchildren meaning they had to be supervised and watched at all times. The Intermarche supermarket is a 5 minutes drive away and very handy. Thank you for your review. LOpale villa is situated less than 5 minutes’ drive from the centre of Le Touquet in a tranquil residential area. It is even closer to the beautiful sandy beach of Stella Plage which is generally much quieter and easy to park for FREE. Although you may find a car useful for visiting the many local attractions there is also a regular “Navette” bus service available at the end of the road that will take you to various destinations in the town. Taxis are also readily available. There is a great cycle path from the house all the way into the centre. Many people hire bikes and have a fantastic time in a town that is very bicycle friendly. The house has a large garden which you are unlikely to find in the centre of Le Touquet without paying substantially more money for your holiday. I have checked your concerns regarding the balustrades and found all openings to be within the recommended safe distance so there is No Heath and Safety Hazard. In the many years we have been renting to families with infants this has never been raised as a problem. From my experience young children always need to be watched in all surroundings and it would concern me if any infant was left unsupervised on any balcony! If you had mentioned your child safety concerns and perceived problem during your stay we could have provided child safety gates which are always available at the house. I inspected the garden and did find one pathway stone that had sunk – which is I assume what you are referring to as a trip hazard? This will be rectified in due course. Perfect for the requirements of our group of 6 adults , 1 baby and a dog. Well situated for shopping and a good walk in the woods opposite for the dog. We were lucky with the weather so the barbecue came in handy. Plenty of games and cards provided along with good washing machine and kitchen. The villa provided a great base for our golf holiday. Close to golf course and had everything we needed to enjoy the week. House was very well equipped and the garden was great to relax in with a BBQ after a day on the Links. Thanks Nigel for the review. I am glad you all enjoyed the golf and we look forward to hearing from you again next year. out of date, needs money spent on it. Driveway is a hazard, steep slope and blind corner. The street is lovely & quiet. The house is spacious with plenty of showers & toilets. You have to go down steep steps to get to the garden so not ideal for outside eating etc. The washing machine was broken and the dishwasher broke within a wk with no effort to be fixed even when I informed the owners. The wifi did not work. The swing and climbing frame were falling apart. The owners have so many rules and high standards it ruin the holiday to some extent, considering the house was not in full working order. We recycled accorded to their rules and left the house in the state we found it except for a major clean which is standard I think. The owners told us we had left it very messy the worst they had seen it, with no attempt to tidy up inside or out, bearing in mind the owners had not seen the property just took the cleaners word for it, we purchased cleaning products, cleaned the kitchen etc swept the whole house and outside, we left no mess! They then took £50 off my deposit, I asked for specific details and for him to let me know what we had done wrong with no answer and no explanation of why nothing was done about the appliances. Le Touquet is a fantastic holiday place I would go back but not to this house. If you stay here be prepared to do a deep clean before you leave!!! The house is old and the finish is not great which is fine, but the owners should take this into account on how they strict they are!! We would never leave property that wasn't acceptable. 1. The wi-fi was fixed quickly after it was reported and no further reports received. 2. The steps to the slide had 1 loose piece of wood which has now been fixed. 3. The guest reported the washing machine door was not working properly but she stated it was usable. I asked for the model number to order a replacement part but no response was received. 4. When i visited the house there was absolutely nothing wrong with the dishwasher! 5. With regards to the drive no one has ever mentioned this as an issue. However i will investigate if a mirror would assist drivers who are new to the area. It is a shame that this guest has chosen to post a very distorted view of the facts because we had to charge her for the additional cleaning and rubbish sorting due to the mess the house was left in. We clearly state that the house should be left in a reasonable condition and rubbish properly recycled. The recycling is important because we get fined by the local council if it is not put in the appropriate bins. Also it is not a pleasant job for the cleaner to have to re sort. We don't have a lot of rules but just ask that people respect the property and broadly speaking leave it as found. L'Opale lived up to all our expectations, it was a lovely spacious house (the front aspect is very misleading!) very clean and extremely well equipped. The house is set in a delightful and quiet road, and there are excellent cycle tracks nearby - we hired bikes! The garden is good and the slide and swing were much used by our 3 year old grandson! The owners were more than helpful in the weeks leading up to our stay, as we had several questions regarding equipment etc as we were taking a 5 month old baby too. There's lots of games inside for children to play, and some daunting jigsaw puzzles for the adults! Le Touquet is only a couple of minutes drive away where the beaches are outstanding - miles of golden sand! The restaurants in Le Touquet are excellent, do try the fish soup at Peraud! Boulogne is only 40 mns away, and another wonderful town, Nausicaa the aquarium there is fantastic and appeals to all ages. Market day in both Le Touquet and Etaples is great fun, so much fresh food to take home and cook back at L'Opale! There is a supermarket nearby, and a wonderful Patisserie for those breakfast croissants! We visited the Commonwealth Memorial at Etaples, very thought provoking, so much so it inspired us to have a day trip to Amiens on the Somme which proved to be a lovely city with the largest gothic cathedral in France - you could fit 2 Notre Dames inside it! The journey was easy, the french countryside around Le Touquet is beautiful and the air is fresh and clean. We had a very happy and comfortable week at L'Opale, it was home from home and we all thoroughly enjoyed our stay. We can thoroughly recommend it! Many good points to this property - lovely position and garden, woodburning stove with good wood supply, very well equipped for a French property and heating was very efficient. The owwers were also very pleasant and helpful throughout the booking process etc. The common problems with French sewage system were very apparent as was a quite unpleasant smell! Added to this the property was not quite as clean and well kept as we expected from the web site. Bits and pieces fell off particularly in shower/bath rooms and there was quite a well worn air to some areas. Perhaps we were unlucky being at the end of what had no doubt been a busy summer season and also having appalling weather which meant we were very aware of interior comfort - or not! We have had hundreds of clients over the years, some that have been back year after year many off which have taken the time to fill in our guest book at the villa and say how much they enjoyed Le Touquet and the villa. We would like to reply to the unfavorable comments made by the guest which we do not feel were justified and by there own admission were possibly influenced by the guest being very unlucky with the weather. Firstly the plumbing, this was immediately investigated and found to be a leaky empty water trap in the en-suite bathroom., now no smell whatsoever! Bits and pieces fell of in the bathrooms – a shower rail screw was loose. We make regular trips to the property throughout the year especially during the summer and make every effort to ensure a very high standard of maintenance. We also have an excellent caretaker who is always available to deal with any more immediate problems..
We really try our best to make our guests feel as comfortable as possible and care deeply that they have a relaxing happy holiday here. We go out of our way to make them feel at home and offer homely surroundings. You may be interested to read the review written by a guest who stayed only 2 weeks later – a completely opposite opinion. We hope that future guests will not be deterred by these unfavorable comments.